Your cooling system is all but useless without a reliable thermostat. 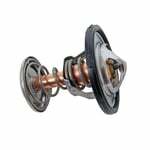 Summit® thermostats have a stainless steel body for long life and high reliability. They kick in just when your engine needs them. Has a bypass valve to allow a small amount of coolant to circulate before fully opening. Chevy small block Gen III/IV (LS-based engines).